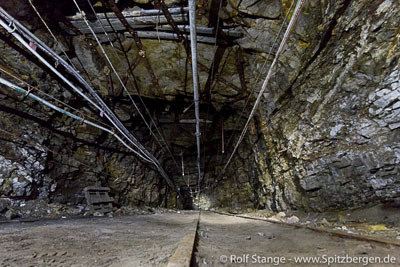 The Norwegian government in Oslo has decided that the coal mine in Lunckefjellet near Sveagruva will not come into productive operation. The mine was opened in 2014 but since then, it has only been driven in standby mode. The mining company Store Norske has suffered badly from low prices on the world markets for coal for years (see for example Store Norske bailout, May 2015). Near 300 employees had to leave, only about 100 are left. These remaining ones will not be able to enjoy their jobs for many years either, since Norwegian Secretary of State for Trade and Industry Monica Mæland anounced on October 12, 2017, that the government will not support renewed productive mining in Sveagruva, namely Lunckefjellet. Further production without financial support from Oslo is not possible. The government is also the owner of the mining company Store Norske. Neither the government nor Store Norske are interested in keeping the current standby operation upright. As a result, the next couple of years will see the phaseout of mining activities in Sveagruva and a big general cleanup of the place. This will, at least, keep most of today’s employees in Store Norske busy. It is also said that the government does not plan major alternative activities in Sveagruva, such as tourism or science. It is, however, not excluded that some buildings may be used for these purposes. The decision does not affect coal mining in mine 7 near Longyearbyen, which is taking place on a comparatively small scale to supply the local power plant and minor volumes for export. Soon history: Norwegian coal mining in Svalbard.